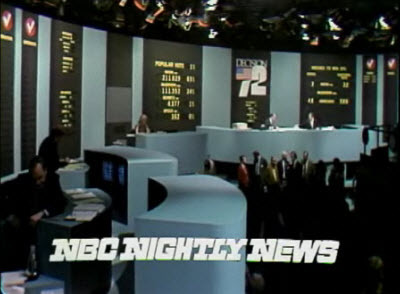 We’ll start with NBC News’ 1972 studio set. 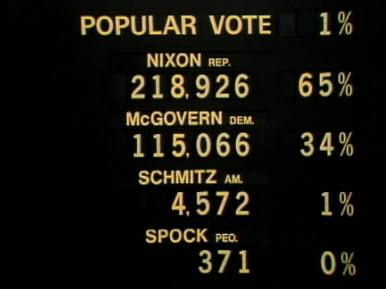 This set, somewhat reminiscent of Star Trek, features simple black and light blue walls and yellow lettering display voting data. 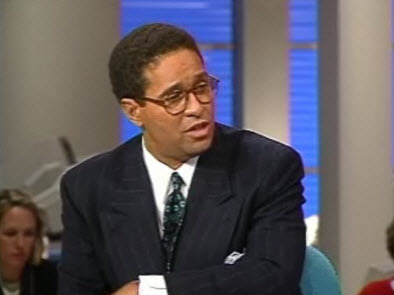 Boy, graphics have come a long way since then. 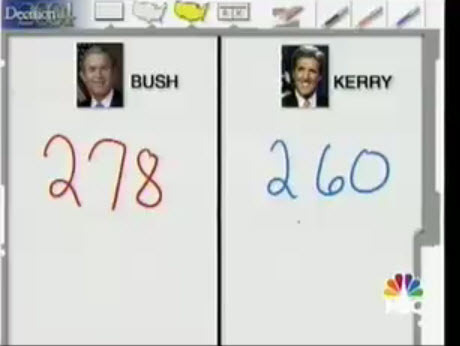 It’s hard to believe that NBC was using simple yellow letters against a black background. 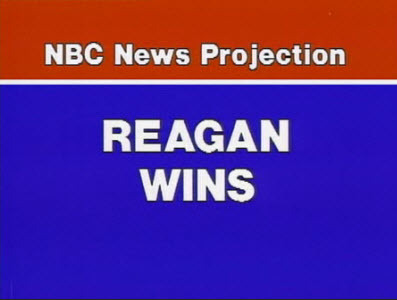 Another simple graphic, this was designed with the words “Reagan Wins” flashing. 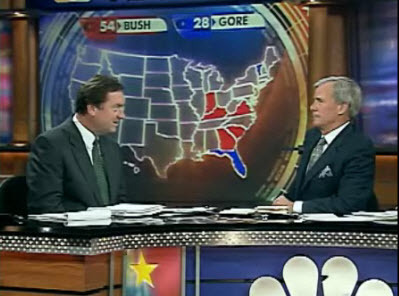 Here John Chancellor and Tom Brokaw sit in front of a backlit electoral collage map. Again, it’s interesting to note how far technology has come; this map uses individual blocks shaped like each state (note would some of the curves, especially in New York, aren’t quite accurate), rather than an RP or other similar screen. 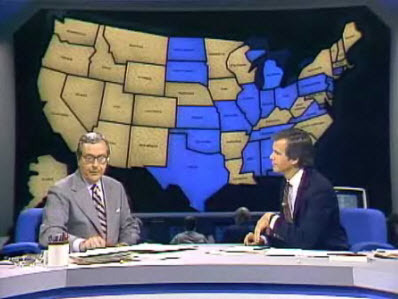 Before going to breaks, NBC would boom the camera up over the anchors and zoom into the map. 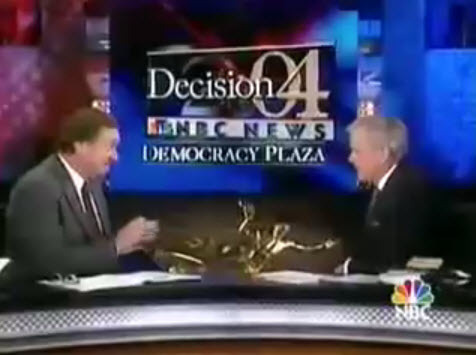 NBC’s graphics start to get a bit better, but are still pretty bland compared to today’s look. 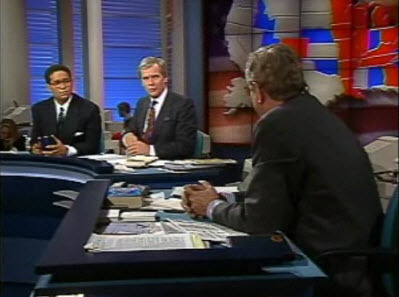 This year Bryant Gumbel and Tom Brokaw took the reigns at the anchor desk, which was situated in front of a large rear projection screen (made up from those great cubes!). The screen is very tall and square-shaped, which is an interesting variety on what we’re used to seeing. Here’s a look at the RP screen being used to show the electoral map, though it’s rather awkward how you can only see the southern-most states. 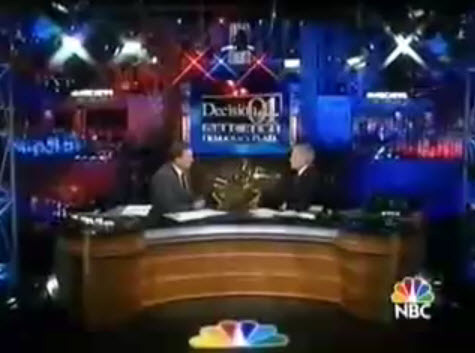 Coming back from breaks, NBC would use a jib shot of its election set and newsroom. 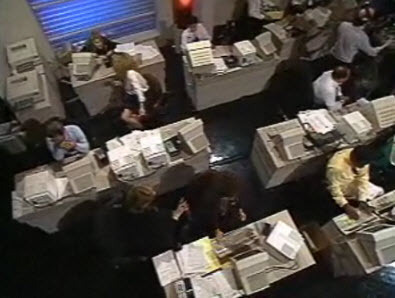 You’ve got to love all those beige computer monitors. 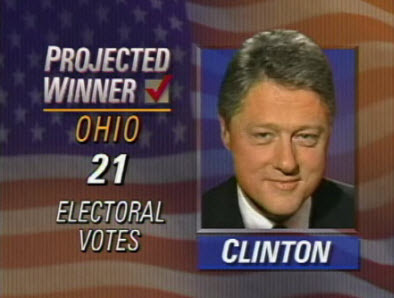 2000 was the scene of what is perhaps the most infamous election in history — will major networks were forced to recant their early projections of Florida. 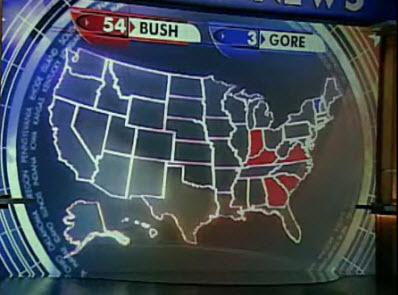 During the coverage, NBC had a locked down camera pointed at the RP screen of the electoral map. 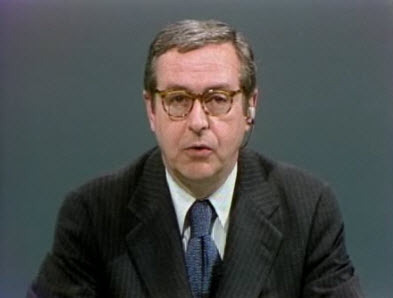 Little did they know that camera would remain in place for days, allowing MSNBC and NBC to pull up the shot at will. 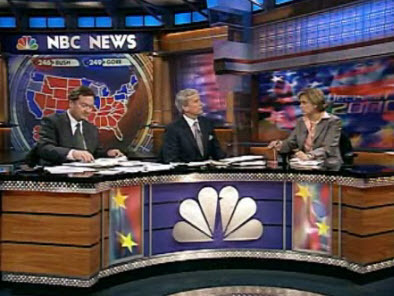 During this year’s coverage, NBC used the “Dateline NBC” set with several modifications including replacement duratrans, an “NBC News” header of the RP and a new anchor desk. This set up worked remarkably well for having been done from a repurposed set. 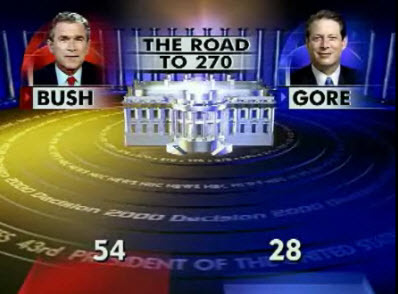 Back in 2000, NBC’s graphics a richer color scheme and also did a good job of differentiating the network’s visual look from the overused red, white and blue typically found in election graphics. 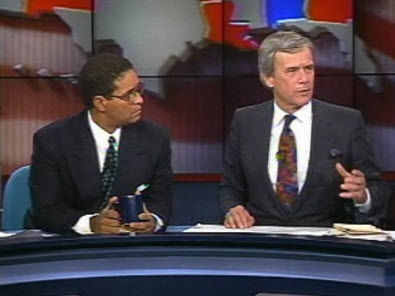 However, this was also the year that fancy graphics were pushed aside in favor of the late Tim Russert’s now famous white board. 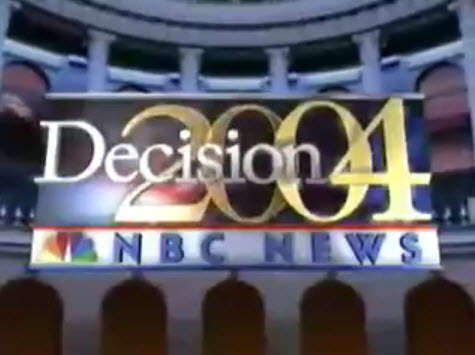 Here we see the “Decision 2000” logo. Variants of this logo were used in other years and, quite frankly, I really liked this logo. 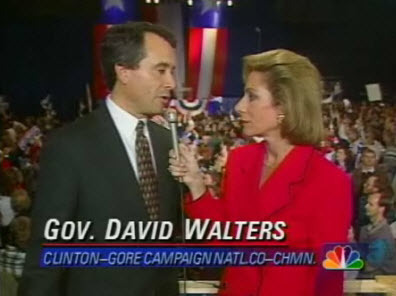 Its use of gold as a dominant color made it stand out from other election logos and the subtle star achieved the same goal. The modern typeface also added a unique look and feel. 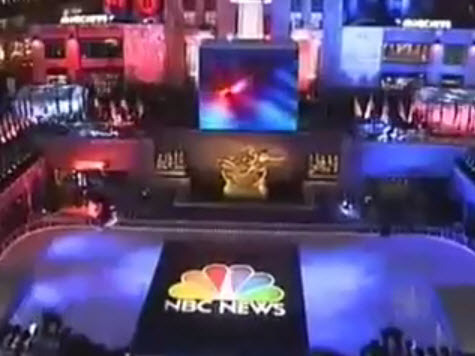 Here NBC has switched over to a more patriotic look that centers mainly around stately columns. Many of these renditions included round “rooms” surrounded by columns and archways, which was a creative way to illustrate politics. 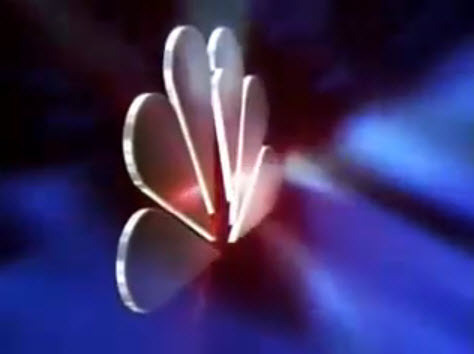 Also in 2004, NBC introduced a new logo. This one skews more toward the red, white and blue color palette, though gold still remains prominent. However, this logo was a bit awkward in that it covered up the “2004,” making a bit difficult to read at times. This logo laid the groundwork for this year’s logo, which uses a similar typeface but adds a abstract American flag and checkmark. 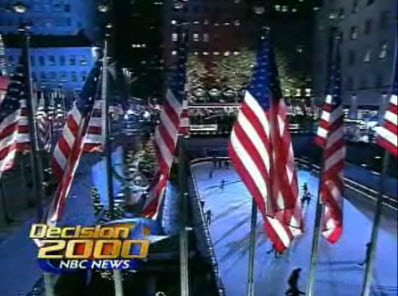 NBC went all out in 2004 with “Democracy Plaza” and presented all election night coverage outdoors in the areas surrounding the Rockefeller Center ice skating rink, which was decked out in an electoral map beneath the frozen surface. 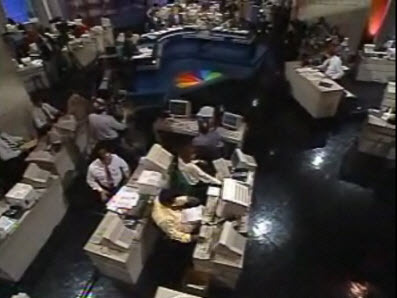 NBC, MSNBC and WNBC-TV each had enclosed temporary studios. 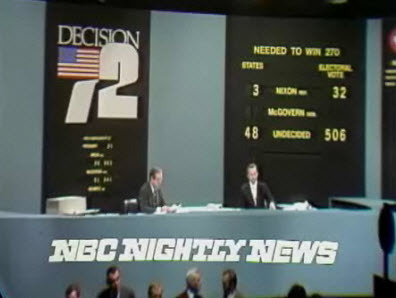 NBC News got the choice position of the center spot, directly in front of the large screen brought in for the occasions. 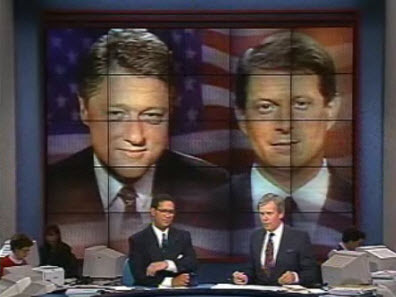 Similar to 2000, this was used for electoral maps and other graphics between Tom Brokaw and Tim Russert, the main anchors. 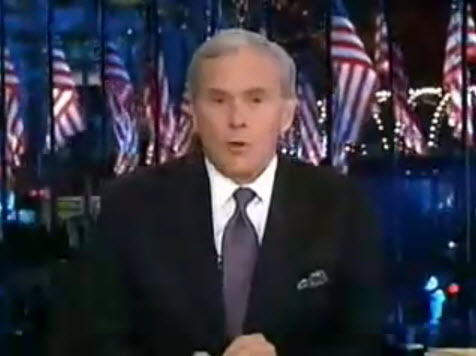 This would be the last election Brokaw would cover as main anchor for NBC News; he would retire in December. 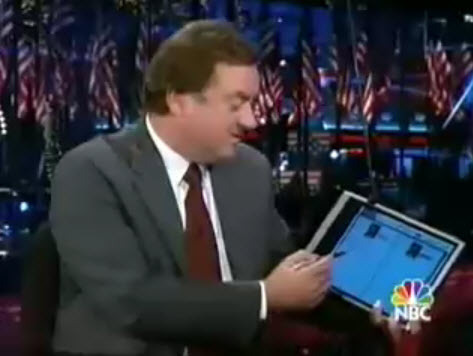 This year Tim Russert’s white board was replaced with a table PC with electronic pen. In addition to behind able to hold it up on camera, the feed could be pulled up as a full screen graphic. Although effective, this solution seemed a bit too forced and much of the charm and folksiness of the white board was lost. 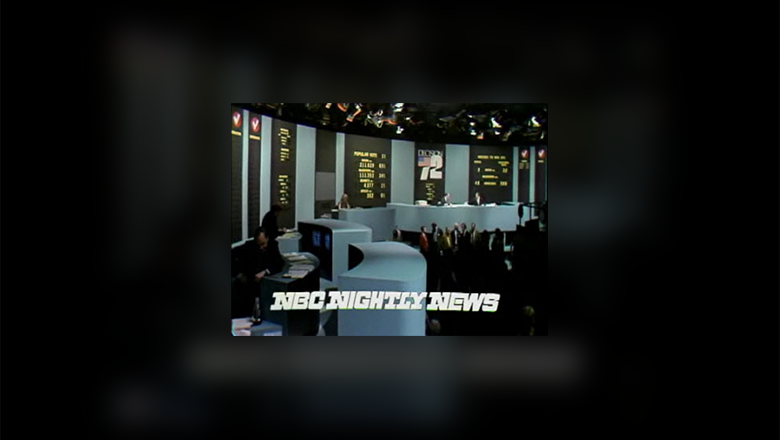 NBC has certainly evolved its look and feel over the years, though many of these improvements to the sets and graphics for election nights are directly linked to the increased availability of technology. Though we may laugh at some of the rather primitive production techniques, it’s also fascinating to see how things have evolved. 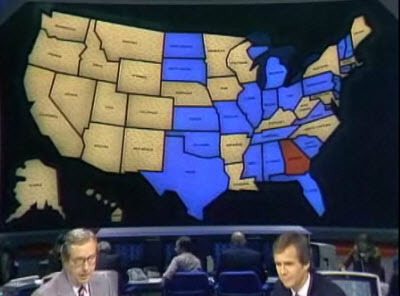 On the same end, however, some things have remained fairly constant: most prominently the large electoral maps used as either graphics or set elements (or both).